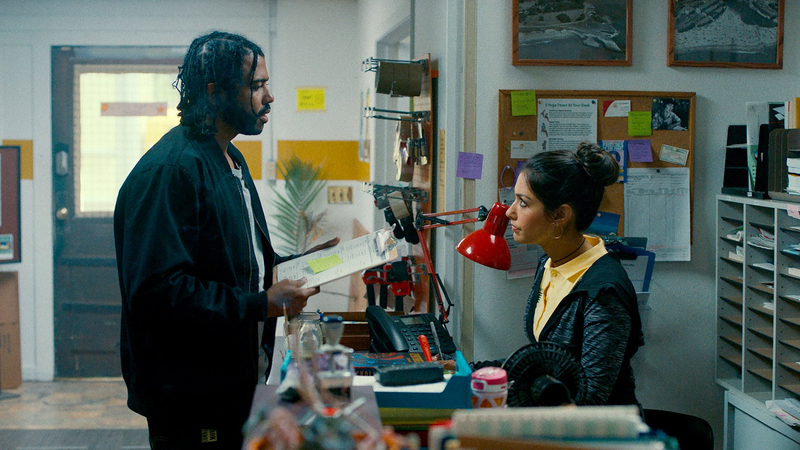 Alongside Get Out, Boots Riley’s astonishing Sorry to Bother You and the blistering TV comedy-drama Atlanta, Carlos López Estrada’s feature debut Blindspotting is the latest in a new moment in social American cinema. Rarely taking the simplistic approach, the Mexican-American director tackles intersectional identity, race and class in this fierce satire on urban Americana. Fresh out of prison, Collin (Daveed Diggs) is on parole for a year, living in a halfway house with an 11pm curfew and no room for error. While his ex-girlfriend Val (Janina Gavankar) secures him a job as a removals man, Collin’s efforts to stay on the straight and narrow are hampered somewhat by his loyal buddy, Miles (Rafael Casal), whose volatility and own personal demons constantly threaten to unbalance Collin. Blindspotting’s early sequences portray Oakland as a vibrant, buzzing working-class community, assisted both by a bouncy soundtrack and a visual sensibility that pops with colour and rich compositions. This Oakland is a place evidently struggling from decades of economic deprivation and segregation, but it’s also vital; heritage and belonging are paramount and identity and pride are as aspirational as the eternally American values of career and profit. Estrada’s Oakland presents a different kind of America – a messy, hard and often cruel place, but one where culture and defiance flourish in spite of numerous obstacles. One of those obstacles is Collin’s criminal record, a shadow that hangs over him, perpetually threatening to drag him back to jail at the slightest infraction. The nature of his crime, much like his sentence and the conditions of his parole, are rather arbitrary – the real question is of the circumstances that led him to it. The answer is invariably race and class. No sooner is Collin out of jail does he find himself in the middle of an illegal gun-deal; later, Miles’ own insecurity and confused masculine identity inadvertently put Collin in a life or death situation. Blindspotting’s concern here is not whether Collin will get out of this or that scrape, but that as a poor black man in America, he is constantly in danger – the question is not if he will get into trouble, but when, forever misread as a thug, a criminal, or a threat. Meanwhile, Miles struggles with being a poor white man in a predominantly black area, his grill and tattoos – authentic expressions of his identity – misread as hipster affectations, while his reluctance to use the n-word revealing his inescapable unease at racial otherness. Some of Blindspotting’s borderline magical-realism may unsettle some – the frequent rapping, particularly in the film’s denouement – nearly tipping into full-blown musical, while the meaning of the film’s title is perhaps a little on the nose. Nevertheless, this is vital filmmaking; Blindspotting is undoubtedly part of a new moment in American cinema and is a fierce, complex satire in it own right.